Finally somebody has found a good use for all those old CRT computer monitors finding their way to the landfills. [Steven Dufresne] from Rimstar.org steps us through a very simple conversion of a CRT computer monitor into a high-voltage power supply. Sure you can make a few small sparks but this conversion is also useful for many science projects. [Steve] uses the monitor power supply to demonstrate powering an ionocraft in his video, a classic science experiment using high voltage. The conversion is just as simple as you would think. You need to safely discharge the TV tube, cut the cup off the high voltage anode cable and reroute it to a mounting bracket outside the monitor. The system needs to be earth grounded so [Steve] connects up a couple of ground cables. One ground cable for the project and one for a safety discharge rod. It’s really that simple and once wired up to a science project you have 25kV volts at your disposal by simply turning on the monitor. You don’t want to produce a lot of large sparks with this conversion because it will destroy the parts inside the monitor. The 240K Ohm 2 watt resistor [Steve] added will help keep those discharges to a minimum and protect the monitor from being destroyed. Yes this is dangerous but when you’re working with high-voltage science experiments danger is something you deal with correctly. This isn’t the safest way to get high-voltage but if you have to hack something together for a project this will get you there and [Steve] is quite cautious including warning people of the dangers and how to safely discharge your experiment and the power supply after every use. This isn’t the first high-voltage power supply that [Steve] has constructed; we featured his home-built 30kV power supply in the past, which is a more conventional way to build a HV power supply using a doubler or tripler circuit. Join us after the break to watch the video. [Jan Rychter] was sick and tired of not being able to find the right power supply for his Nixie tube projects, so he decided to design his own. [Jan] started out designing around the MAX1771 (PDF) DC-DC controller, but quickly discovered he was having stability problems. Even after seven board revisions, he was still experiencing uncontrolled behavior. He ended up abandoning the MAX1171 and switching to the Texas Instruments TPS40210. After three more board designs, he finally has something that works for him. [Jan] admits that his design is likely not perfect (could have fooled us! ), but he wanted to release it to the world as Open-Source Hardware to give back to the community. The end result of [Jan’s] hard work is a 5cm x 5cm board that generates four separate output voltages from a single 12V source. These include both a 3.3V and 5V output for digital logic as well as a 220V out put for Nixie tubes and a 440V maximum output for dekatrons. The circuit also features several safety features including over-current protection, thermal shutdown, and slow-start. Be sure to check out [Jan’s] webpage to view out the schematics and technical information for this awesome circuit. Need some Nixie tubes to go with that circuit? We know some resources for you to check out. Or you could always just build your own. How can you use this board in your next project? [JAC_101] wrote in to let us know that the Truely Mad Scientist’s LVL1 Splinter Group just built a simple Alpha Particle detector. The detector is a high voltage DC spark gap that is triggered by ionizing radiation. 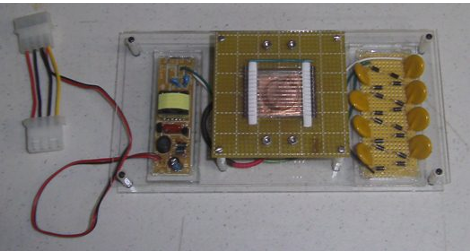 Making one of these detectors involves gutting a cold cathode power supply for some high voltage AC, then bumping that source up to crazy high voltage DC with a Cockcroft-Walton generator. Once the spark gap distance is carefully adjusted it will light up brilliantly with the introduction of a radioactive source, we are told. There are no videos, or even pictures of the thing running, but we found this one that is pretty darn cool. Maybe all that spark-gap related RF killed their camera or something, their page at least promises videos soon. In the mean time check out Truely Mad Scientist’s LVL1 Splinter Group’s ionizing cloud chamber for more radioactive fun.